Parnallee, Tamil Nadu, India LL3.6 Parnallee was an observed fall in 1857. This is 1 of 19 approved meteorites classified as LL3.6 and has a TKW of 77.6Kg(MetBull). 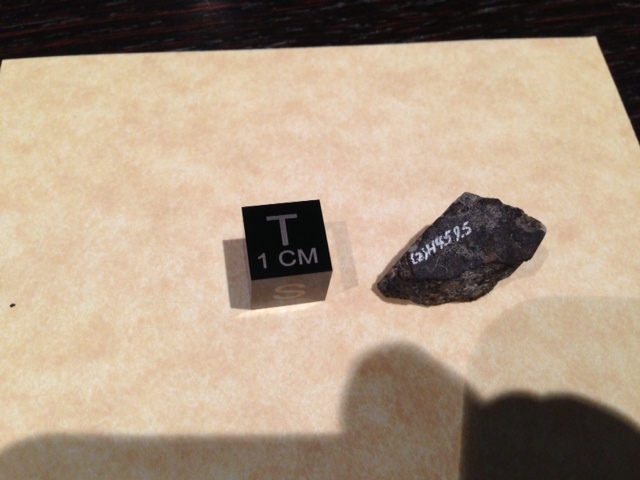 This small fragment is from the Glenn Huss Second Collection of Meteorites which are very rare since most are believed to be in the Natural History Museum of Vienna. Art XLV. – Notice of a Meteorite which fell in Hindostan in 1857; by J. LANG CASSELS, MD, Professor of Chemistry, Cleveland Med. Coll., Ohio. “Two meteoric stones fell on the 28th of February, 1857, from a clear sky, about noon, near the village of Parnallee, where some of our Christian people live. The smaller one weighs 37 pounds, and the larger is three or four times as heavy. The larger fell first, the smaller two or three seconds after, and some two or three miles south of the first one. The larger falling into tenacious and hard earth sunk into the ground but two feet and five inches. It came from the north, making an angle with the vertical of about fifteen degrees. The noise which these meteorites made while passing through the atmosphere is described as being terrific to all in the vicinity; and Mr. Tayor adds, that it was reported to have been heard some 15 to 20 miles from where they fell.